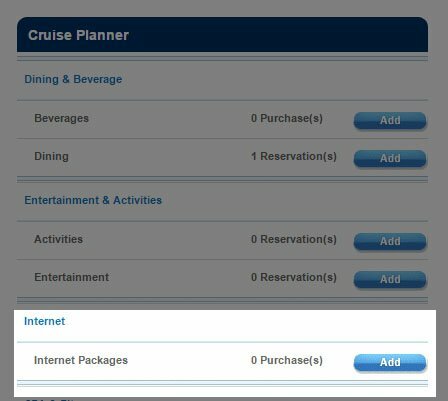 Two new internet options are now available for guests to book that provide onboard internet options, depending on their needs. This appears to be the Voom "light" offering, that provides internet service for basic web browsing, email and social media but without support for video streaming. Voom Surf + Stream is essentially the Voom internet offering guests have experienced up until now, with full support for all internet activities. Which Voom package will you buy? Tell us in the comments! 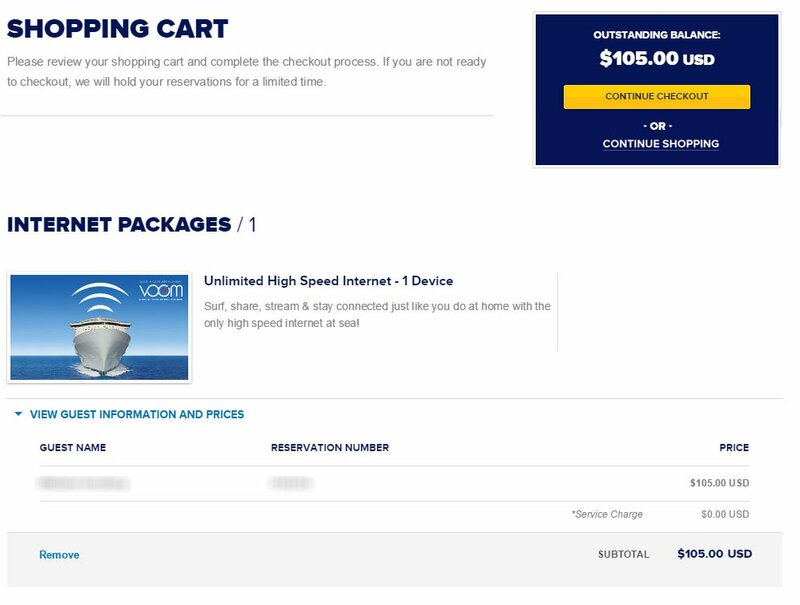 Royal Caribbean is starting to offer its guests an internet package that supports up to 4 devices connected at one time on select sailings. 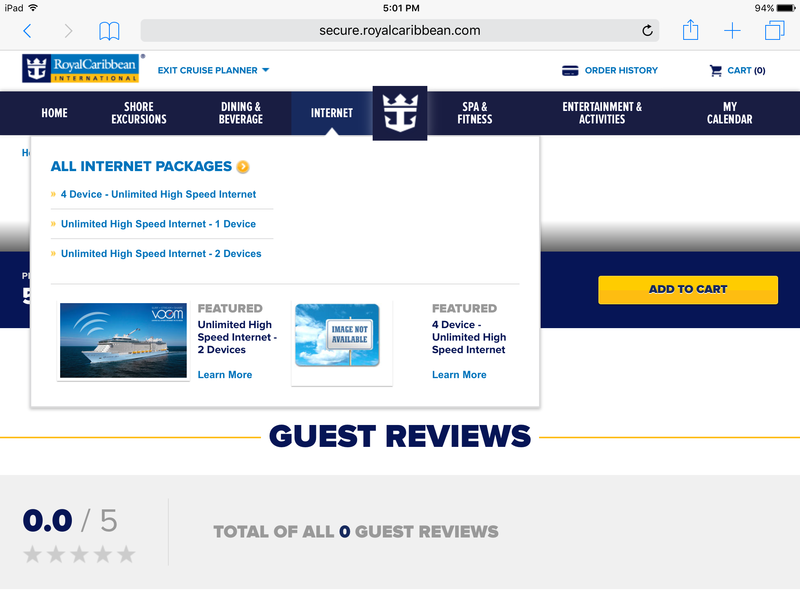 Royal Caribbean Blog reader Ken Houston spotted on the new offering, which has a price of $40 per day. Royal Caribbean has been offering unlimited internet packages for one or two devices, at $15 per day or $22.50 respectively. This new option allows more devices to remain connected, which would save money for families cruising together. 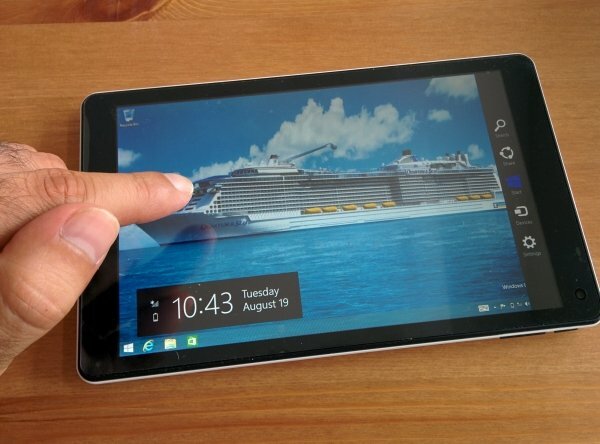 Thus far, the new 4 device internet package is not available fleetwide yet, and has been reported on Oasis of the Seas, Allure of the Seas and Anthem of the Seas on sailings that begin this week, going until about January 2, 2016. 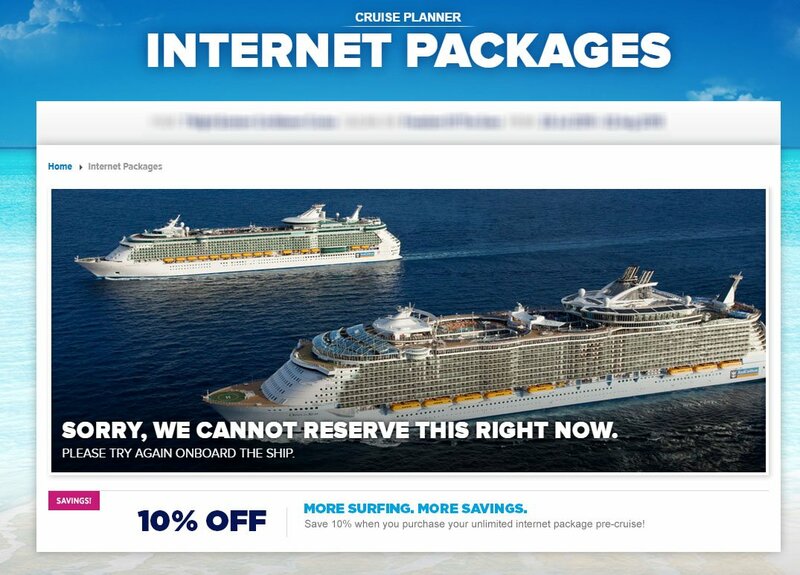 Royal Caribbean has begun selling onboard internet packages on at least some of its cruises via the Cruise Planner site. Last week, Royal Caribbean added the option to sell onboard internet packages in advance, but the feature was not activated. As of today, some sailings have the option activated. 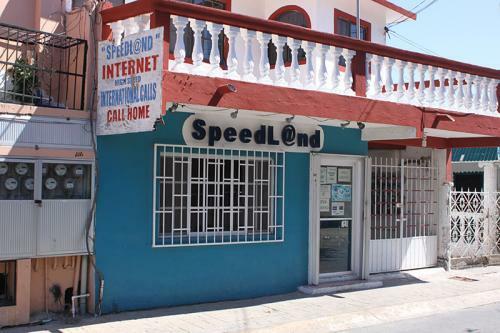 The prices for onboard internet packages seem to vary depending on the ship you are sailing on. 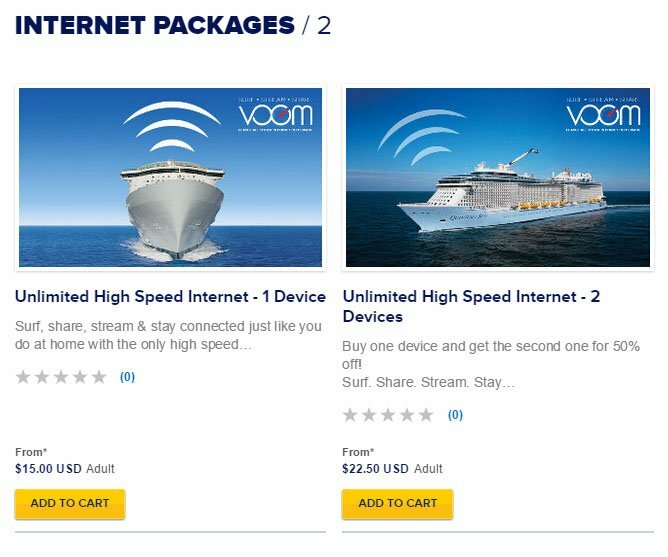 UPDATE: It appears that Royal Caribbean ships equipped with Voom, the high-speed internet access, are charged $15 per day, while ships on the older and slower internet technology will pay $20 per day. It is not clear if the prices shown include any Crown and Anchor Society member discounts or if discounts can be applied to the price. 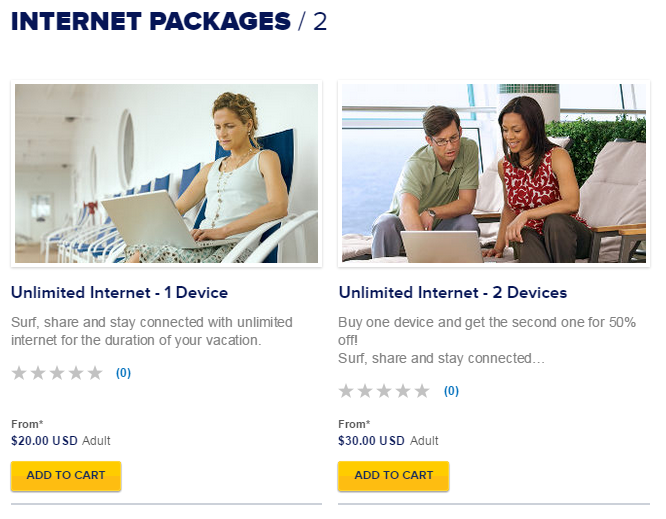 Typically, Crown and Anchor Society members receive discounts on an internet package purchase while onboard the ship. During our research, this option was available on Allure of the Seas for a cruise in February 2016 but not for our upcoming Freedom of the Seas July 2015 cruise. 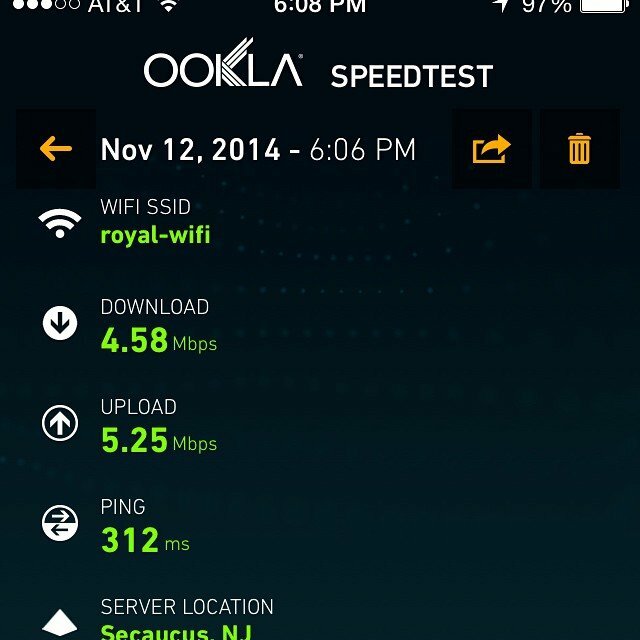 Is purchasing an internet package available for your upcoming Royal Caribbean cruise? Will you pre-purchase your internet package online? Let us know in the comments! Royal Caribbean is poised to begin selling its onboard internet packages in advance of its sailings to passengers via the online Cruise Planner site. A few blog readers have spotted the new offering in their My Cruises section of Royal Caribbean's web site. Guests are given the option of saving 10% off the unlimted intenet package if they pre-purchase the package online, although the actual ability to purchase the internet package remains disabled as of the writing of this blog post. In the past, purchasing of onboard intenet packages was only available onboard Royal Caribbean's cruise ships. It is also not clear yet how members of Royal Caribbean's customer loyalty program, Crown and Anchor Society, can apply their discount coupons or if the coupons can be stacked along with the pre-purchase discount of 10%. 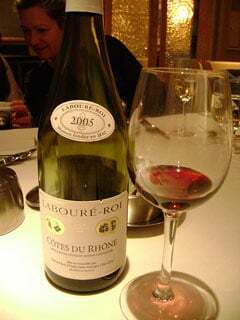 Royal Caribbean has confirmed that it is testing an an all-inclusive alcohol and unlimited internet packages. Royal Caribbean confirmed packages are being tested but added, "We do not have final details on which ships would receive the packages at this time or what those packages would look like." According to passengers aboard Allure of the Seas, the unlimited alcohol package is being offered currently for $55 per person plus 15% gratuity and both of the people in her cabin had to sign up for it. Reports are the package includes all house wine, beers under $6.25, fountain sodas, well/call or premium brands of liquor and frozen drinks. It does not include room service, specialty coffee, minibar items, canned sodas, bottled water or bottled juices. Another passenger reports that the unlimited internet usage package is available onboard Allure of the Seas for $149 a week. Royal Caribbean confirmed Allure is testing such a package but wouldn't offer additional details on which ships are part of the trial, which ships might eventually get the package or what the package will ultimately cost.